Jo Ann Watson, an Exploration Station Educator with the San Bernardino County Museum of Natural History said, "The pattern of every snake is like a zebra's stripes, it is a fingerprint unique to that snake." This truly points out what is the crowning glory of the corn snake. 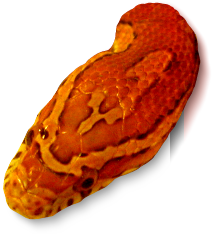 Vivid colors of red, orange, or brownish blotches edged with black and a grayish to orange background tinged with yellow, characterize the glossy coat of an adult corn snake. They're usually 25 to 38 of these dorsal blotches with a corresponding number of lateral blotches. The dorsal blotches are usually wider along the snake's length. There are 27 to 29 dorsal scale rows around the circumference of the snake at the middle of the body. These scales are weakly keeled. The ventral scales (the snakes belly) usually consists of alternating rows of black and white (though orange may also be present), resembling maize corn. Corn snakes from the Western North Carolina region usually have a duller coloration. On the underside of the tall are two black stripes, and on the head and neck a spear shaped pattern. Corn snakes from the southeastern region of the Florida peninsula may be grayish with distinct blotches. This is because they are anerythristic, which means their genes have turned off their ability to produce red pigment. This gives them a grayish body with black splotches. 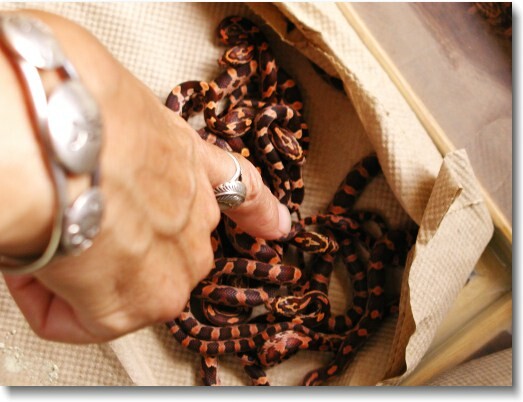 There are also corn snakes that cannot produce black pigment, these are called amelanistic. When a corn snake is both anerythristic and amelanistic the result is a snow corn snake. Several types of wild corn snakes with characteristic patterns have been given their own names. 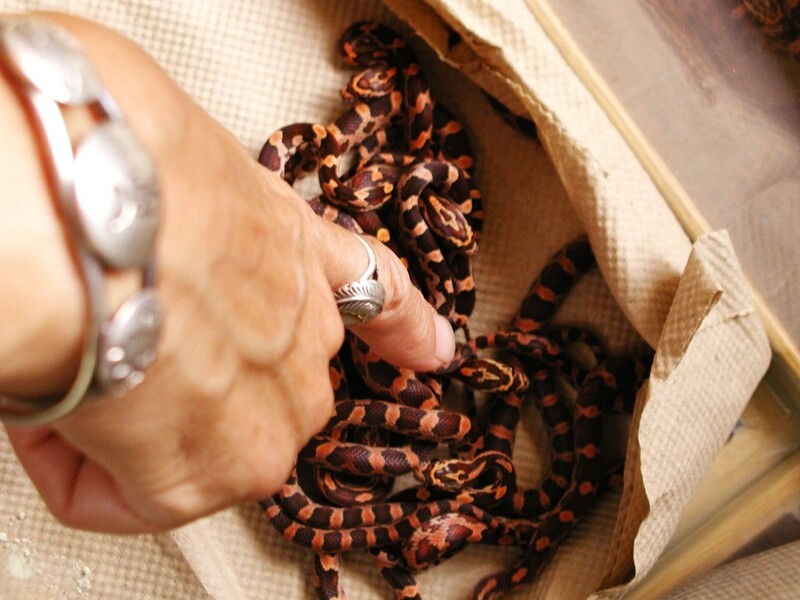 Jo Ann Watson, an Exploration Station Educator with the San Bernardino County Museum of Natural History points out the patterns on baby corn snakes. Rosy Ratsnake -- Corn snakes from the lower Florida Keys. They are smaller, and characterized as having less black pigment than their mainland relatives. Miami phase -- Characterized by bright red blotches on a silvery background. Okeetee Corns -- Found in South Carolina, these are usually considered "the typical" corn snake. Characterized by a bright orange snake with bold black bordered red splotches. It is worth noting that not all corn snakes that look like this originate from South Carolina bloodlines. Chocolate Corns -- These Snakes from Central Louisiana, East Texas, East Oklahoma, and Arkansas were formerly considered to be members of The Great Plains Ratsnake family because of their coloration and geographic location. However, now scientists consider them to be corn snakes. Characteristics include a light to dark gray ground color, with blotches from rusty redish brown to dark brown. 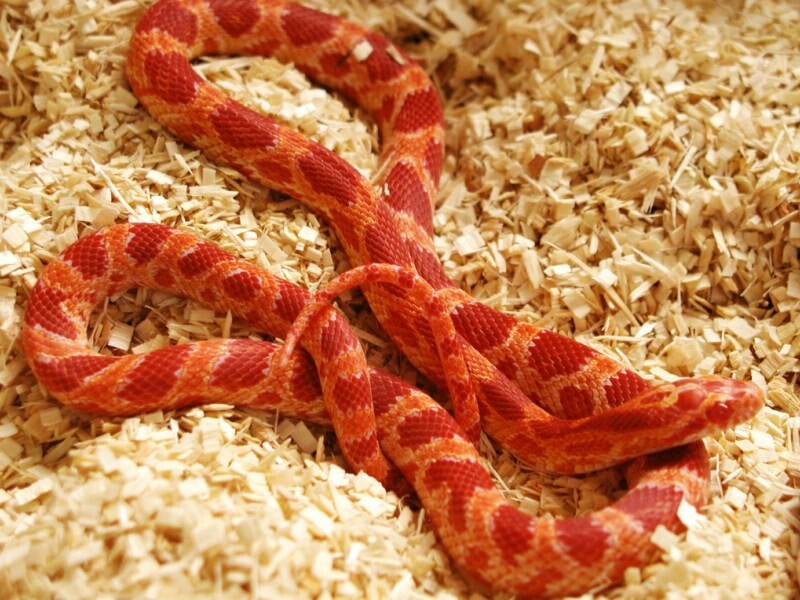 Corn snakes are easily bred in captivity. Many with striking color patterns and variations, which would not normally occur in the wild. There are more captive bred species of corn snakes than any other reptile, so here are only a few of them. Amelanistic -- This red albino corn snake is the oldest captive bred strain of corn snake. Characteristics are a lack of black pigment. 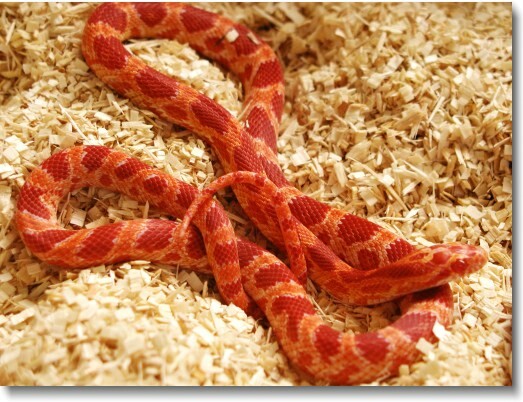 Anerythristic -- This breed of corn snake lacks red pigment in its color. There are two types of Anerythristic corn snake, Type A which has a little yellow, and Type B which does not have any yellow. Motley -- Irregular fusion of blotches.